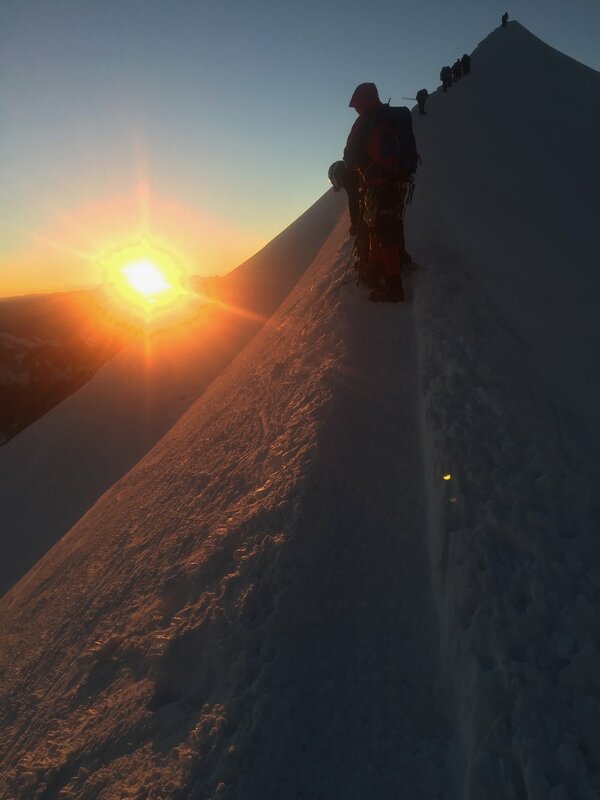 A guided ascent of Mont Blanc with a Chamonix guide. 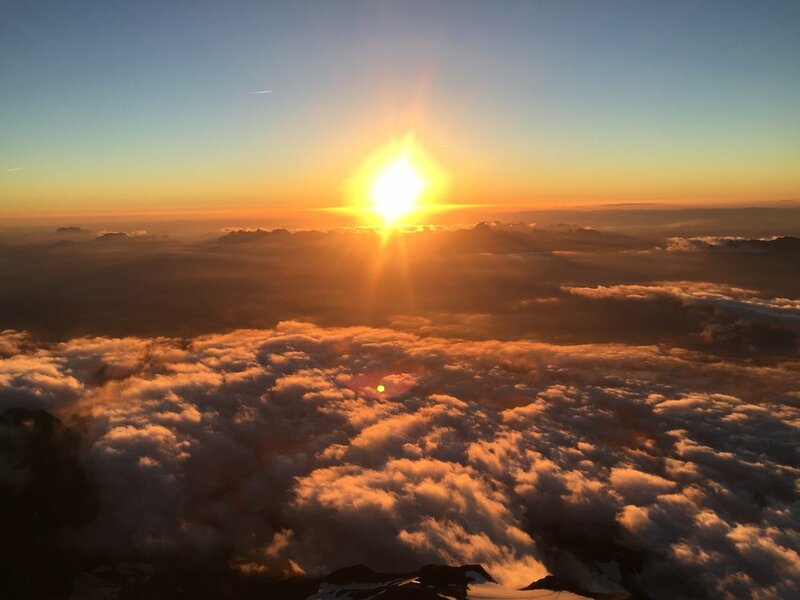 Even if Mont Blanc is one of the most sought after peaks of the Alps, climbing the highest mountain of the Alps remains a great physical challenge. The vertical gain and length of the climb make this a very worth while achievement. The local old timers have a saying that "MONT BLANC must be earned". A statement which is indeed very true. It is therefore essential to allow adequate time to acclimate and practice your climbing skills. My program lasts 7 days and is designed to achieve just that. The first part of the week is spent learning how to crampon and use an ice axe correctly, this is followed by learning about safe glacier travel, route finding, planning and orientation. We will also do practice climbs on nearby peaks to acclimatize and get better familiarized with the MONT BLANC range. This course is designed to get you on "top"! 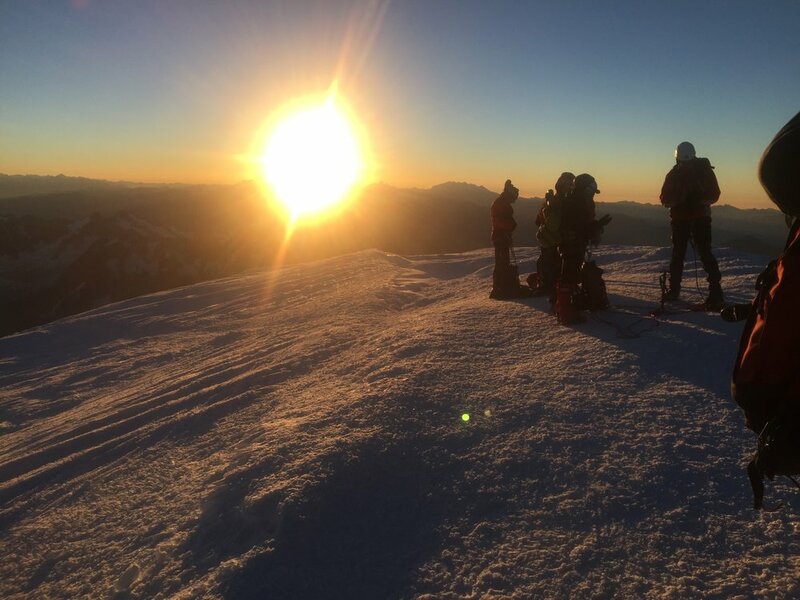 7 days - optimised time to practice with the equipment AND acclimate by summiting a 4000m peak beforehand - essential for success. Reserved Huts - Any pre-booked course guarantees that you have your space in one of the "high huts". I don't believe in using Tete Rousse or "three day" Mont Blancs. Using either the Gouter hut or the Cosmiques hut gives you the best possible chance to summit with the shortest possible summit day. Climbing the entire week with the guide you will attempt Mont Blanc with. Climbing the Gran Paradiso in Italy with Mont Blanc Guides. The Gran Paradiso is the highest peak in Italy at 4061m and can be accessed via the rifugio Chabod or the Victor Emmanuel huts. The ascent takes place in the beautiful Gran Paradiso National Park and involves a 2200m vertical ascent spread over 2 or 3 days. Mont Blanc is the highest summit of the western Alps and a very worthy achievement for any mountaineer. Contrary to what some people may say, it is NOT an easy walk in the park. Mont Blanc is a demanding ascent on easy snow slopes but due to the altitude and length of the ascent, it remains a difficult enterprise. Welcome drink and evening brief of the course, weather forecast and gear check. The order of the day is to acclimate and get your first look at Mont Blanc from up close. 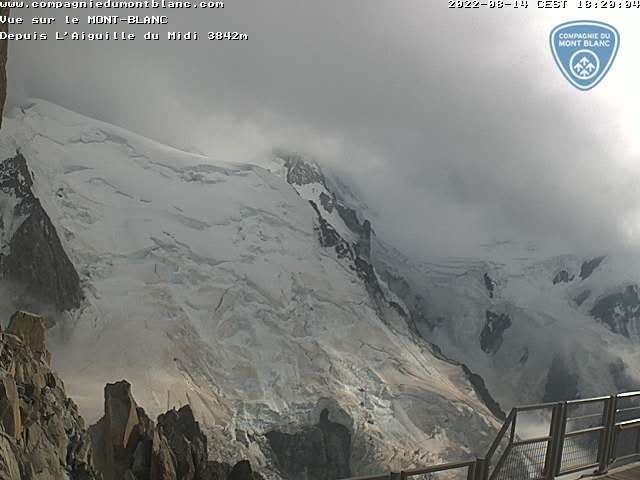 We will meet at the Aiguille du Midi cable car station and then head off down the narrow summit ridge to the glacier plateau below. From here we traverse across the infamous vallee blanche to practice glacier travel and using crampons to reach the Italian border. After a short espresso stop, we ride the lift back into town for the night. Night in Chamonix. Today we head to Italy and the beautiful excursion to the Gran Paradiso national park located in the Aosta valley. The days itinerary provides a stunning hike through larch forests and alpine meadows to reach the friendly Chabod hut. From here the views are absolutely panoramic with Mont Blanc to the north and the Gran Paradiso looming to the south. Night at the Chabod hut. Our first alpine start gets underway with a long walk up a rocky moraine ridges to reach the snow and glacier coming from the Gran Paradiso. A long gentle approach brings us to a final steeper ridge and eventually the striking rocky summit and your first 4,000m peak of the week. Descent via the same itinerary and late afternoon return drive to Chamonix. Night in Chamonix. Today you get a lazy start and casual breakfast before heading to one of the local rock crags to practice rock craft. A review of knots, glacier travel technique, rescue scenarios, belaying, rappelling and some climbing are all part of the day. It will be important to listen to what your body needs and make sure to relax. Night in Chamonix. Today gets under way with a ride in the Bellevue cable car in the town of les Houches to catch the TMB, a cog wheel train and finally its destination of Nid d'Aigle or "Eagle's Nest"at 2373 m (7,783'). From this lofty perch we will hike along a good trail, which will gradually get steeper and more rugged to reach the Tete Rousse hut 3150 m (10,332'), where we will have a quick lunch. 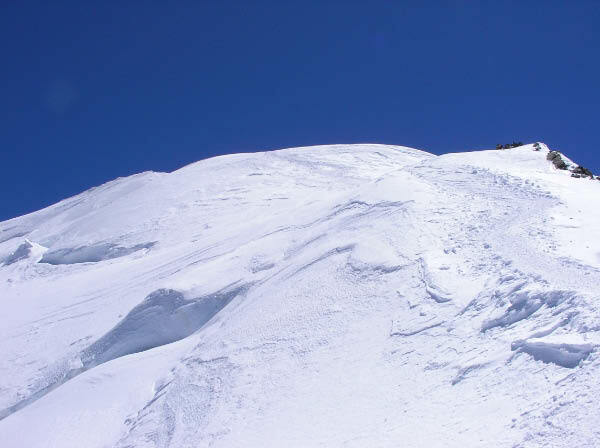 We then push on and traverse the infamous gully that lies below the Gouter hut. From here the real climbing starts, we move roped together on a steep, exposed shoulder of the Aiguille du Gouter to finally reach the hut. It generally takes about 5 hours to reach the hut which will give us the afternoon to rest and prepare for the following days big ascent. Night at the Gouter hut. Altitude 3818 m (12,523'). 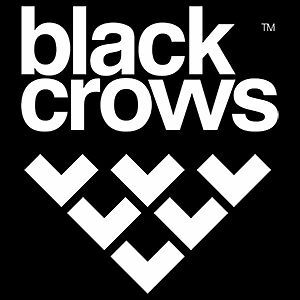 This is it, the big day. We get up very early - 2 am and quickly put on harnesses and crampons. Upon leaving the hut and climbing up to a ridge behind the Gouter Hut, the light spectacle is quite amazing. It is pitch black all around us except for the headlamps of those in front and in back of us. Looking over the edge of the ridge, you can see the 7,000+ vertical feet back into town and the glimmering lights of Chamonix.But for now, we must concentrate on finding a steady pace. One that will carry us throughout the long day. We begin by climbing up to the pass of the Dome du Gouter 4305m (14,121 ft), then across the plateau and up to the Vallot emergency shelter 4363m (14,311 ft). Here we stop to replenish our energy and maybe add a layer of clothes - sometimes the wind can be fierce and the temperature well below zero. Now it's off to the final push, up several steep ridges, the famous Arete des Bosses, past the Tournette rocks and along the fine ridge which is equally the border separating France from Italy. Finally the summit - MONT BLANC - the highest mountain of the Alps 4810m. It's time to celebrate, snap some pictures and look off into the distance at the other giant peaks of the Alps -that surround us - the Grand Paradis, Grandes Jorasses, Matterhorn, Mont Rose, Dent Blanche, Grand Combin, La Verte, the Oberland Bernese mountains of Central Switzerland, the Aiguilles Rouges, the Fiz, the Aravis, Belledone, the Ecrins, the Tarentaise, etc....An ascent that will give you memories for a lifetime. This day is designed to be used as a buffer in the event we encounter unstable weather during the course - we have the option to use this for an extra climb should all go to plan - and you still have the energy for more adventure! Excellent base fitness – prior experience is very helpful but not absolutely necessary. Please do not under-estimate the nature of the course. This is full on mountaineering and not a simple walk up a hill. There are some minimum standards that have to be met, such as uphill per hour and being successful on the training peaks. Some moderate to steep snow, mixed terrain and rock. For the ascent of Mont Blanc the max ratio is 2:1 for the Gouter route and now 1:1 on the 3 Mont Blanc route. If more than 2 participants sign up, each group will climb with their own guide the entire week. *This is a super important detail that pays dividends when on Mont Blanc itself - you want to know your guide just as much as your guide wants to know you! Meeting your guide the day before an ascent is far from ideal. I don't believe in courses where the climber to guide ratio is different than that of the actual ascent. This is how "guide companies" become greedy....at your personal expense.